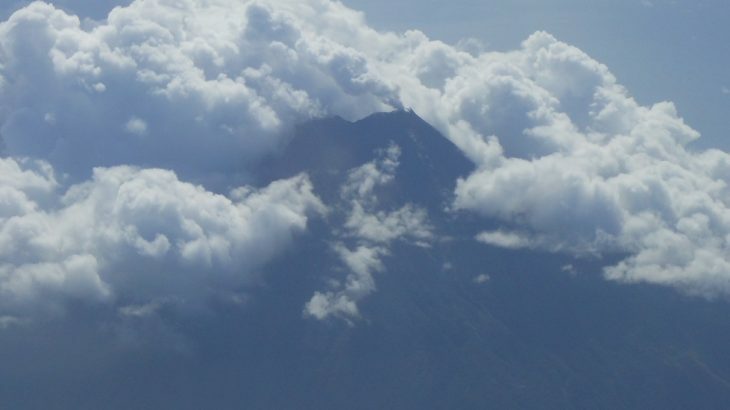 This volcano is supposedly the most active in Indonesia. It is the highest point of Siau island in the Sangihe Islands off the north coast of mainland Sulawesi. It has five summit craters and a north peak and a slightly higher south peak. Trying to climb to the top is probably asking for a lot of trouble! However, a wander round the island is well worth it in order to have a look at the devastation caused by previous eruptions. Siau is also a particularly beautiful place with some excellent beaches. There are apparently three routes – Kampung Dompase (at 558m) where you can also visit the Vulcanology Post to see the monitors, look through books and ask for information, Lintatua (‘old worm!’?) which is not far from the main town of Ulu, and the more northerly approach from Dame. Dame is recommended for good photos at sunrise but climbing from Dompase which takes 25 minutes to reach by motorbike from Ulu is very straightfoward. In less than half an hour of hiking from the end of the cement track at Dompase you will have reached the start of the lava flows and bare rock leading to the summit. At night you can often see the orange glow of lava and hear volcanic explosions. Getting there: There are boats from Manado (or Tahuna) several times a week. The fastest is the Prima Oasis which takes about 4 hours from Manado and 2 hours from Tahuna (which has a small airport). Accommodation: A few hotels in Ulu – notably the Hotel Jakarta which is pleasant, clean but prices don’t include breakfast. Permits: Not required, but it is probably a good idea to check with staff at the Vulcanology Post in Dompase with regard to the status of the volcano. Water sources: Unknown – take plenty with you. Very saddened to hear that the previous guide we recommended recently asked a guy for 1.4 million to hike Karangetang. This is insane. It is like me charging £1000 for a dayhike up Helvellyn in the English Lake District. Sadly, Indonesia – and particularly the tourism industry – is full of moneygrabbers with about as much integrity as highwaymen. It gives the country a very bad impression and rest assured that in the event of an emergency or accident most of them would vanish quicker than a ghost. They love to feast on foreign wallets and will try to do the least amount of work for the most amount of money. Don’t be fooled by their smiles and sob stories. Anything more than Rp350,000 a day anywhere outside of Papua and you are being ripped off. Those rich enough to pay stupid sums simply encourage it to happen to others who most likely do not have that sort of ridiculous money available. Do not put up with it and do not make it the norm for others. Rp350,000 is a good fee for a day’s hike on Pulau Siau. I climbed Karangetang three times inbetween mid of August and beginning of September 2017. I repeated the hike not because I liked the walk up so much but rather because I was a bit unlucky with the weather conditions and the timing during the first two hikes. Yet, I wanted to reach the top for sunrise and take some nice aerial shots, which eventually I succeeded with during the third attempt. The hike always started at the guide’s house, according to my GPS at about 500m asl, located in a village called Linta Tua (apparently referring to the big number of leeches to be found there during rain season). The house is one of the last at the upper end of the village, just right before the jungle begins. The guide’s wife always provided us some coffee and local snacks before we eventually departed. The first time this was at around 3 in the morning, which obviously was too late for reaching the top for sunrise given that we had to bridge roughly 1,400 meters in elevation. 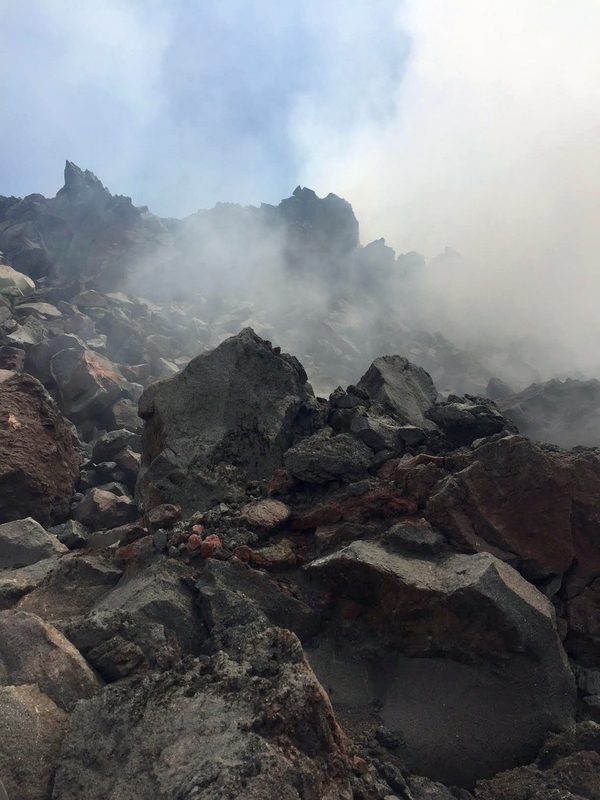 The guide, however, said he needs daylight beginning from about 1,500m in order to assess the risk level, as two days before the volcano had shown increased activity and spit rocks and lava bombs. Therefore there was no need to take off earlier. The second time we started earlier – yet it was too late to reach the top for sunrise – reason was that my Ojek toward the guide’s house was too late and, moreover, had not enough petrol in his scooter, which he realised just on the steep incline toward the village. In consequence, I had to walk up to the village from about 100m asl, causing me being late. The walk starts – for about the first 100m in elevation – with a comparatively light incline, leading through some rather open forest with a number of commercially used nutmeg, coconut and banana trees scattered in between. The hike then continues into thick forest with steeper incline. Here two different options exist to going up: the first one leads through the forest for maybe about 30 minutes and then continues on an old lava stream beginning from about 800m asl. This route we took during the first hike. The second route leads through the forest for an hour (without break) and then too continues on an (other) old lava stream, at about 1,100m asl. This second route appears to be faster, though the track through the jungle is a bit tougher. The forest is dense and the guide’s machete was in use more often than I had expected. The path was small, slippery, muddy, steep and overgrown with all kinds of plants, and bigger trees’ crowns blocking any light from the starry sky. Also lots of (hundreds) millipedes were laying on our way, which requires caution as they can eject some liquid that is said to be unhealthy especially for the eyes. The high humidity soaked my clothes in no time, water and sweat constantly running from my forehead. DUring the second hike i was wondering that at a certain moment the guide used his machete constantly. so i asked him if he got lost. and he replied that yes, indeed, he got lost. yet, i fully trusted him as he explained to me every directional decision he took by then. We were back on track after half an hour. Having eventually left the forest, a very nice view over the southern flank opened up, toward the southern tip of the island and the night lights of Ulu. The hike itself I would not describe as particularly demanding with respect to the required physical condition, at least if one is used to hiking mountains. It is rather the geological characteristics that I found challenging and risky, requiring constant concentration with each step. I can just confirm Ben’s experience: The tricky part is that no path leads up to the top once the forest is left behind. The entire mountain resembles a huge pyramid of loose rocks. At the beginning the rocks are more like big blocks, overgrown with a thin layer of moss, making it a bit like walking on a carpet. Yet, one needs to take care as the rocks often are loose and with every step one risks to twist one’s ankle. The higher we walked, the more diverse became the size of the rocks, from pebbles size to 3 meters in diameter. And with the moss disappearing further up, the rocks became razor sharp. Even the guide, who started off barefoot, now took on his shoes. The shoes of a few locals who joined me for curiosity (and never climbed the mountain before) were completely destroyed after the track, the sole just hanging loose, and the sides slit open. So were mine, after the three hikes onto this mountain. The further up you go, the steeper it gets, and the smaller the stones become. It sometimes almost felt like walking on marbles. This is particularly tricky when walking down, which is why the descent took me always longer than the ascent, just as Ben described already. With every step I made, I first had to test the impact my step will have on the stones and rocks above. A false move and the stones laying further up will come down and might leave you with bloody shins (as I had every single time I walked up/ down), or you will just slide down some ten or twenty meters on all fours. Not least for this reason, I would also highly recommend to bring gloves. They have cheap ones (1€ the pair) in the city of Ulu. Often the terrain is so tricky that you have to use your hands, literally walking up on all fours. But then again the rocks are so sharp, the fingertips will easily be cut. I destroyed 2 pairs of gloves during the three hikes. The top offered an amazing view, especially during sunrise, when all the steam coming out of the dark grey flanks seemed a bit mystical in the low, orange light. Unfortunately, it was impossible to look into the crater, as the sulphuric steams were massive. We climbed onto the southern part of the crater rim (wind came from south, so no risk to breath this stuff). And the smoke or steam came from every little hole and crack. And of course it was really hot and stinky, yet a truly amazing experience (also having the words in mind that i read here regarding the few people that ever climbed it). I personally prefer (from the excitement level) seeing ash clouds and little eruptions, such as one can observed on Semeru or Dukono. But the amount of gases was so high here that it was really impressive. According to the gps of my drone the gas cloud was at least 200 meters high. I also checked my GPS for the height of the peak, standing on the crater rim, and it said 1903 meters. There certainly is some inaccuracy with my GPS (android phone). Yet, as the mountain was quite active during the last year and, according to my guide, ejected a lots of stuff, it seems reasonable to me that it is a bit more than measured by Ben. On the video one can see though that it wasn’t the highest point of the mountain. The north eastern part of the crater rim is I would guess another ten meters higher. But it was impossible to get there, let alone that due to the smoke/ steam it was even impossible to see that there actually is a higher part. Only when cutting the video it became clear to me that we were not on the very puncak. Directly next to the active crater is another crater that doesn’t seem active anymore. We didn’t walk over though. It might be possible, but we didn’t want to risk it. Standing on top one can also see that the mountain actually has two summits or cones, the other one being at the north eastern tip of the island. The guide told me that there is another possibility to hike, from the northern side, where one can also reach the other peak. We haven’t tried this though. All in all a very nice experience with the very particular terrain challenging your body tension;). I stayed at Kalea Beach Cottages, a rather simple yet nice and calm place about half an hour (by scooter) south of Ulu, on the eastern coast of the island. Ayu, the owner and manager of this place and fluent in English, provided the contact to our guide, Sonny. He said he has hiked Karangetang about 100 times already. He lives on the lower, southern slopes of the mountain. He said he also goes up to the top alone from time to time when no tourists are around, seeing it rather as his hobby. He speaks Indonesian only. If an English speaking guide is preferred, one can also hire his nephew Dominik (the guy mentioned by Dan and Ben). Dominik does the registration of tourists who enter the island through the harbour in Ulu. He also guides tourists to explore other spots on the island. Dominik is said to be more expensive though and less knowledgeable about the mountain. Sonny charged me very reasonable 350k IDR for the hike. Plus, his family, sons, dog, wife, are very kind and hospitable! To get there, one can either grab a motorbike or an ojek. From Ulu it takes maybe 20 minutes, from the Kalea beach resort it took me about 45 to 50 minutes, almost an hour even. The concrete path up to his place is very steep (as the majority of the roads on this island) and cannot be accessed by car. At the end of the concrete path one still has to walk up another 40 or 50 meters (in height) to reach his house. His phone number is (+62) 0853-4005-5376.
i forgot: the ascent took us 3.5 hours and the descent about 5.5 hours, staying on top for ca. 1.5 hours. Great stuff. Many thanks for the report. Great stuff…Planning to follow your steps and try to climb Karangetang this July…I managed to contact Dominik but he asks for 1.400.000 to guide me…TOO expensive!!! I’ll try to contact your guide through Kalea Beach Resort..Or you can suggest something else…Thanks! Last Sunday I rounded out my half-century on the summit of Karangetang – the first British person, sixth non-islander, and apparently one of less than a dozen people ever to have done so (excluding, perhaps, the emperors and their virgins. I was only able to achieve this thanks to the current lull in seismic activity (after a ten-month spell of continuously spewing lava last year). 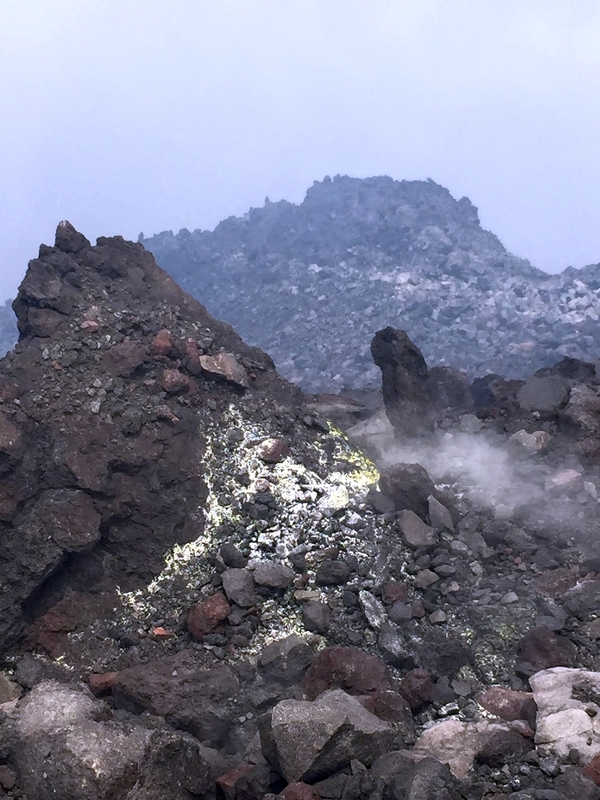 Despite this, the summit cone remains a truly infernal place, with noxious sulphur, belching fumeroles and general instability under foot. I climbed with Dominik’s uncle and his 11-year old son (who both went most of the way barefoot), plus the family dog. Son and dog were both defeated by the hot rocks and poisonous gases and elected to remain below the summit ridge, so only Uncle and I reached the actual top. My iPhone app showed 1834 metres on the top. The route looks deceptively simple – an hour’s hike up through the forest followed by a another two-hour scramble over conveniently sized boulders. In fact, the ascent is extremely challenging – steep, slippery, often non-existent jungle tracks, followed by long pitches over last year’s lava field. The descent is pure hell, especially for someone over 90 kg not wearing gloves: the loose rocks and my weary body made things seriously treacherous. The final descent through the forest has to be negotiated in the dark. All in all, it was three hours up, ten seconds on the top, and eight hours down. The views from the lower slopes are stunning; higher up, visbility decreases substantially. But I had been on the lower slopes before – back in 1997 – and I was eager to summit. I am glad I did. I will never do so again. Ever. 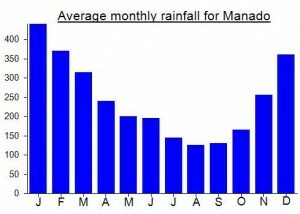 Our taxi driver at Manado airport told us how, unlike Jakarta, Manado never floods. Later that night he was to be proved sadly incorrect as about 17 people died in torrential rain which seemed to last nearly 24 hours. The following morning we were onboard the very pleasant Prima Oasis fast ferry (an ex Hong Kong to Macau ferry) in plenty of time waiting for departure at 12 noon. Tickets to Siau were about 250 each for VIP (bring your jacket as the AC turns the room into a freezer). Unfortunately the captain’s house had been affected by the flooding and we didn’t leave Manado until 3pm! Also in the VIP room was the friendly mayor of Siau himself, Toni Supit. He told us there was a plan to build an airport in Siau. He also told us of a Dutchman who had been to the island and had ‘baptised’ the lesser peaks on the island. We spent most of the time out on deck looking for dolphins (a few were spotted not too far beyond the Buanken islands). It took about 3 hours to reach the first stop – Tagulandang, which is adjacent to the attractive Ruang volcano island. It was dark shortly thereafter and on approach to Siau you could see sparks of orange in the sky as lava tumbled from the summit craters of Indonesia’s most active volcano. Apparently 3 local people died last year due to pyroclastic flows. They were never found. Local guide Dominik was also on the boat and turned out to be one of the nicest guides I have ever met. Unfortunately the weather the following morning was very grey and windy so our short trip to have a look at Karangetang from Dompase was cut short due to the rain. In addition, the trail itself had changed according to Dominik, in the last couple of weeks. No surprise really given the frequent landslides and eruptions. It cleared up a little bit in the afternoon so we took ojeks around the south of the island, visited the Makam Raja Lokombanua – the grave of the first Emperor of Siau – in Paseng. Dominik told us that in pre-Portuguese times the Emperors sacrificed local virgin girls by throwing them into the summit craters in the hope it would pacify the spirits of the volcano. I was also shown an empty area at Kampung Karung where a large eruption 6 years ago had destroyed an entire section of village houses. We planned to try hiking again the following morning before the onward ferry journey up to Tahuna, but once again there was torrential rain all night, to the extent that I think we each woke up wondering if the little town of Ulu was about to turn into a disaster zone. 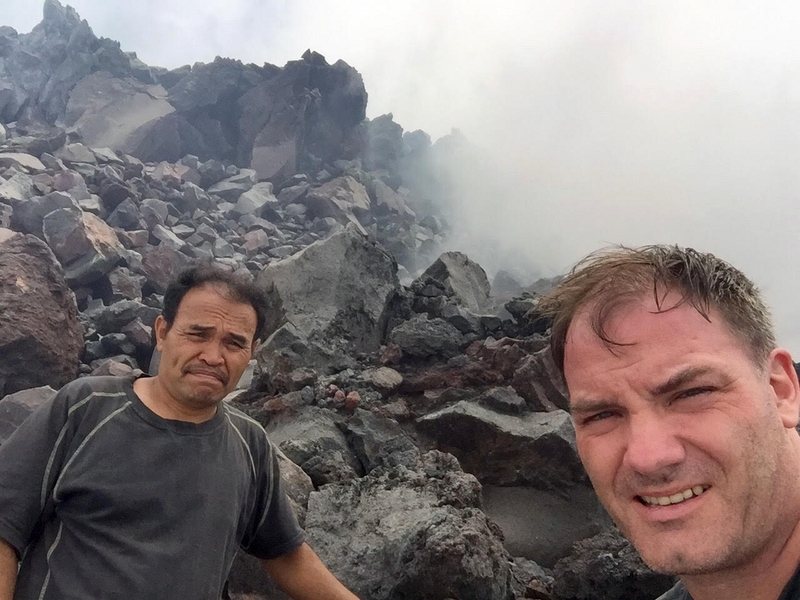 The hotel walls seemed pretty thick, but that did little to calm the nerves, staying as we were on the slopes of Indonesia’s most active volcano! We made it through the night and were delighted to find the ferry on time. Landslides had occurred and on the northern part of the island we spotted what looked to be a serious landslide at the coast where perhaps 2 or 3 houses had simply collapsed. Even though it would normally be utter madness to climb this volcano right to the top, it is an incredible sight both by day and by night and the beaches, bays and coastal roads are well worth exploring. I also really recommend Dominik (see guides list for his number or ask at Hotel Jakarta which is close to where he lives) who is a man of many talents including carpentry.